Extending the Northern Zone muskie fishing season and applying a 50-inch muskie size limit to nine lakes in Vilas and Oneida counties will be among the proposed rules changes that will be voted on at the Wisconsin Department of Natural Resources (DNR) Fish and Wildlife Spring Hearings in each county next Monday, April 8. Meetings in this area will be held at St. Germain Elementary School for Vilas County, James Williams Middle School in Rhinelander for Oneida County, and Crandon High School for Forest County. All meetings start at 7 p.m.
People interested in natural resources management will have the opportunity to provide their input and testimony on proposed rule changes and Wisconsin Conservation Congress (WCC) advisory questions relating to fish and wildlife management in Wisconsin. The first muskie proposal would extend the open fishing season for muskellunge from Nov. 30 to Dec. 31 during open water on all inland waters north of Highway 10, on all Wisconsin-Michigan boundary waters and on outlying waters of Lake Michigan and Green Bay north of Waldo Boulevard, Manitowoc. 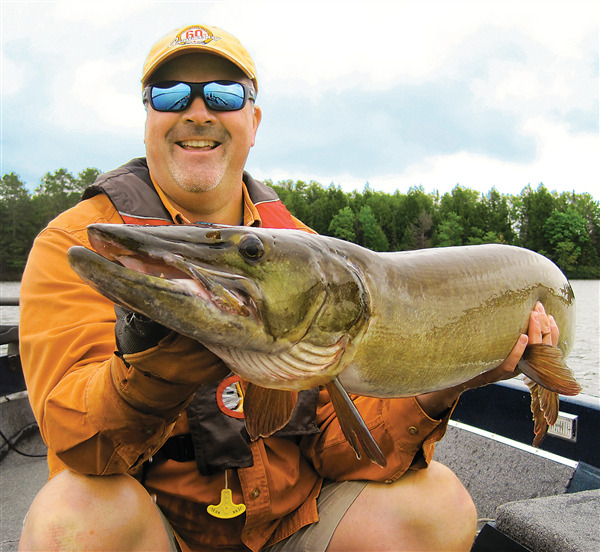 The second muskie-related proposal would apply a 50-inch minimum length limit for muskellunge in White Sand Lake in Vilas County, and Rainbow Flowage and Little Tomahawk, Mud, Tomahawk, Mid, Minocqua, Jerome and Kawaguesaga lakes (Minocqua Chain) in Oneida County. The current regulation is a 40-inch minimum length limit. • Establish a statewide (including Michigan boundary waters), continuous open season for bass fishing, but allow harvest only during the current traditional season. • On the Turtle-Flambeau Flowage and connected waterbodies (Iron County), apply a 12-inch minimum length limit for walleye with only one fish over 15 inches allowed for harvest, and a daily bag limit of three walleyes on the Turtle-Flambeau Flowage and connected waterbodies. The current regulation is no minimum length limit and a daily bag limit of three. • On all inland waters, establish a daily bag limit of 10 fish in aggregate for cisco and lake whitefish on Wisconsin’s inland waters, which would be consistent with existing ­regulations on outlying waters and Trout Lake, Vilas County. The current regulation is a daily bag limit of 25 pounds plus one fish. • For bass on Smoky Lake in Vilas County, remove the minimum length limit but apply a 14- to 18-inch protected slot limit and one fish over 18 inches allowed for harvest. The current regulation is a 14-inch minimum length limit. The daily bag limit of five fish will remain the same. • On the Lake Winnebago System (Calumet, Fond du Lac, Green Lake, Marquette, Outagamie, Shawano, Waupaca, Waushara and Winnebago counties), reduce the daily bag limit to three walleyes or sauger with only one being a sauger or hybrid, with no minimum length limit. Some of the proposed statewide wildlife rule changes include: allow trapping on or within 15 feet of beaver dams on public and private land, with permission from the landowner; change the river otter framework from a quota/permit system to a bag limit/quota system; move the close of pheasant season daily shooting hours on public properties stocked with pheasants from 2 p.m. to noon on weekdays from the third day of the pheasant season through Nov. 3; and return to a three-zone frame­work for mink and muskrats. The spring hearing input process allows the public the opportunity to comment and register their support or opposition to DNR-proposed rule changes as well as Congress proposals that could someday become the rules that regulate fishing, hunting, trapping and other outdoor recreation activities in Wisconsin. This year, the Congress will be presenting 38 advisory questions for input, including: conducting a pilot chronic wasting disease Payment for Positives program in 2019; a statewide baiting and feeding ban for deer; require pheasant, grouse and quail hunters to wear blaze orange or pink; change the youth hunting age limit back to 10 years old; increase the inland trout stamp from $10 to $15 to allow for more trout stream restoration; and ban lead ammunition and fishing gear in Wisconsin. Citizens may also submit ideas to address conservation needs or concerns they observe through the WCC resolution process. County residents have the option to run for a seat on the Conservation Congress and to vote for the WCC delegates to represent them. However, providing input on resolutions or participating in the WCC election will continue to require in-person participation. This year’s spring hearings will offer additional opportunity for the public to weigh in. The DNR and WCC will provide an online option for input for those people who aren’t able to attend a hearing in person or for those who’d rather provide input at the hearing using their smartphone. For security, and to ensure the integrity of the results, individuals will be required to sign in to use the online version, just as they do in person. People who want to attend in person can find meeting locations on the DNR website at dnr.wi.gov. The 2019 Spring Hearing questionnaire is also available by searching the DNR website dnr.wi.gov for keywords “Spring Hearings.” An online input form will go live at 7 p.m. on April 8 on that page and remain open until 7 p.m. on April 11. People who attend a hearing in person but would rather provide their input using the online option instead of the paper form, can choose to get a random verifiable number (RVN) at the hearing instead of an input form. The RVN can then be entered into the online form when prompted. Providing an RVN will allow the person’s input to be compiled along with the input provided by the in-person attendees in the county in which you attended. People unable to attend a hearing in person can use the online form without an RVN; responses submitted in this way will be compiled and considered part of the overall input but will not be county-specific.